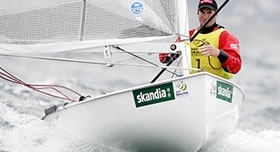 The Finn dinghy fills the slot for the Heavyweight Dinghy in the Olympics. It was designed in 1949 by Rickard Sarby and was first used at the Olympics in 1952 in Helsinki. It has been used at every Olympic regatta since then.